Youngsters are invited to make and eat their own breakfast as they lift flaps, open gatefold pages and pull tabs. 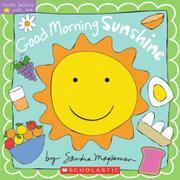 In the sunny-colored cartoons, readers can flip an egg, juice an orange, open the refrigerator and more. One page per spread hosts the interactive features, while the facing page invites participation with a text that vacillates between rhyme and prose. The final spread includes a double-page gatefold with the text, “Now let’s eat.” Readers open the fold vertically to reveal a smiley-faced place setting with eggs for eyes and a jelly-drawn mouth. The pages and the gatefold flaps, on stock that is somewhere in between typical board-book and hardcover-paper weight, look sturdy enough, but the tabs won’t hold up to routine wear and tear and don’t offer what the text promises. The sliding spatula does not allow for egg flipping, the juice cup has to be emptied via a pull of a tab before it can be filled, and the bread must be raised before readers can make toast. Magsamen’s simple, popular graphics have worked in other books, but her flat style does not lend itself to illustrating food.